Turnip cake is a Chinese dim sum dish made of shredded radish (typically Chinese radish or daikon) and plain rice flour. The less commonly used daikon cake is a more accurate name, in that Western-style turnips are not used in the dish; it is sometimes also referred to as radish cake, and is traditionally called carrot cake in Singapore. It is commonly served in Cantonese yum cha and is usually cut into rectangular slices and sometimes pan-fried before serving. Each pan-fried cake has a thin crunchy layer on the outside from frying, and soft on the inside. The non-fried version is soft overall. It is one of the standard dishes found in the dim sum cuisine of Hong Kong and China as well as overseas Chinatown restaurants. It is also commonly eaten during Chinese New Year, since radish (菜頭, chhài-thâu) is a homophone for "good fortune" (好彩頭, hó-chhái-thâu) in Hokkien. 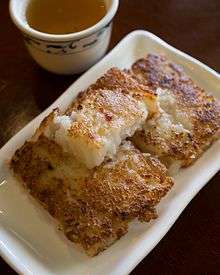 In Taiwan, turnip cake is also commonly eaten as part of a breakfast. To prepare a turnip cake, roots of Chinese radish, also known as daikon, are first shredded. Chinese radish, either the white-and-green variety or the all-white variety, is one of the key ingredients since it makes up a large portion of the cake. The other key ingredients are water and rice flour. Corn starch is sometimes added as it aids in binding the cake together, especially when a large number of additional ingredients (see list below) are added. The ingredients are stirred together until combined. These flavoring ingredients may first be stir-fried before being added to the radish and flour/starch mixture. Somewhat more luxurious cakes will add larger amounts of these ingredients directly to the mixture. Cheaper variants, especially those sold in dim sum restaurants will often just have a sprinkling on the top, to keep costs down. This combined mixture is then poured in a steamer lined with greased aluminum foil or cellophane, and steamed at high heat for 40 to 60 minutes until it solidifies into a gelatinous mass. For those with allergies to radishes, some recipes substitute turnip for radish. Taro or pumpkin cakes are other variants. Although the steamed turnip cake can be consumed straight with soy sauce, they are commonly cooked again to add additional flavors. For instance turnip cake can be sliced into rectangular pieces when cooled and then pan-fried until both sides turn golden. It is served with chili sauce and/or Hoisin sauce on the side, as condiments. 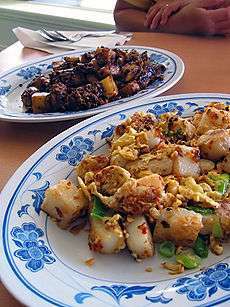 Turnip cake can also be stir-fried and made into the dish Chai tow kway. ↑ Bartholomew, Ian (24 January 2008). "New Year's Eve dinner: easy as pie". Taipei Times. p. 13. Retrieved 16 July 2011. ↑ "Turnip or Radish Cake with Chinese Sausages". tastehongkong.com. February 23, 2010. Retrieved 6 September 2012. ↑ wantanmien (2010-01-23). "Chinese Dim Sum steamed turnip cake (Lo Bak Gou), 教做蘿蔔糕 (Cantonese)". youtube.com. Retrieved 6 September 2012. Wikimedia Commons has media related to Carrot cake (Chinese).